Special tour packages for senior citizens by Globetrouper to help them rejoice their Golden age! Old age is the time to express your soulmate, "My time is all yours." With Globetrouper Senior citizens tour packages to India you get an opportunity to live again the beautiful years of life with love and togetherness. The creative travel designers are here for you to plan your travel package to enthrall minds, warm hearts and touch souls. This is a thoughtful gift to a person for whom "gift" was always as giving. The golden vacations is yet another opportunity to live all those dreams and create some new memories. For our valuable senior nationals, most special and interesting tour packages are offered by this travel designer in Jaipur, India. The senior citizen tour packages that we offer are slow paced, comfortable and have well planned itineraries, keeping in mind the expectations and convenience of the senior citizens. While planning the itineraries, our expert travel planners ensure that you have all the entertainment and fun that you long for. We also make sure that you get sufficient relaxation time to soak in the surroundings and enjoy. 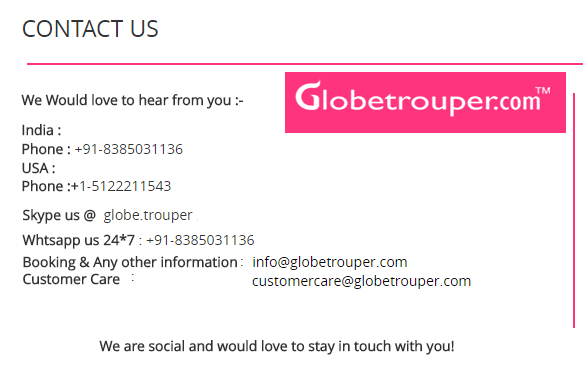 Plan your trip with Globetrouper and our expert travel planners in India promise to provide you with an extra and special touch of delicate care where you can enjoy without any worries. Celebrate the life all over yet again. Live the extraordinary moments with us and we make sure you love it. Come with us and commemorate the Golden age.